You will feel the energy as soon as you get off the plane at Detroit Metropolitan Airport’s McNamara Terminal and make your way through an underground tunnel exploding with a colour-changing light and sound show. The Light Tunnel uses LED lighting to illuminate glass panels with sand-blasted Michigan artwork in a dazzling, multi-sensory show that’s synchronized to an original score by an Ohio outfit. “Welcome to Motor City,” the pilot said when we hit the tarmac. “Welcome to Art City,” is what he should have said. Something remarkable is happening here. The city is exploding with art and food and activity. Creative types are coming from all over to be part of the transformation. Stop feeling sorry for Detroit. Stop being scared of Detroit. The story here is no longer automobile industry collapse, decline, decay and blight. It’s about a glorious city that birthed the Model T and Motown, that’s coming back better, stronger, artier. Let Kim Rusinow of Show Me Detroit Tours give you a guided bus tour. 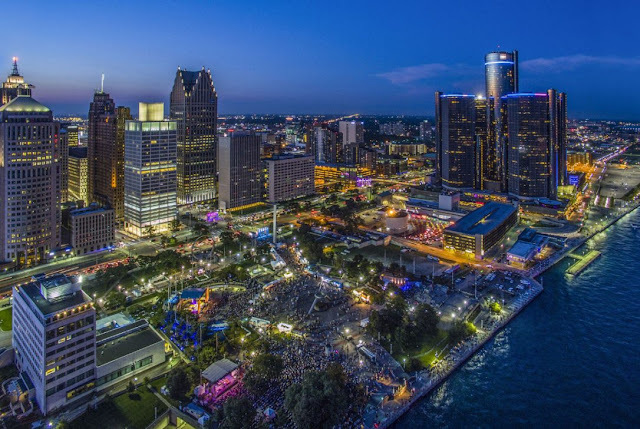 There’s Midtown with the “eds, meds and arts.” That’s short for universities, medical centres and Sugar Hill Arts District anchored by the Detroit Institute of Arts and the Museum of Contemporary Art Detroit. Downtown fills up with passionate sports fans when the Detroit Tigers are playing Comerica Park or the Lions are at Ford Field. Next year, Little Ceasars Arena will give the Red Wings a dynamic home between downtown and Midtown and anchor a new sports and entertainment district called the District Detroit. Also downtown is Greektown with its three casinos, but I’ll be taking the kids on the Detroit People Mover, with art in all 13 stations. It’s just 75 cents and you can stay on the single-track train loop as long as you want. Culturally cool Corktown is fully hipster and home to the Detroit Institute of Bagels, Batch Brewing (the city’s first nano brewery), music destinations, such as the UFO Factory and Hostel Detroit, with its free walking tours. Nearby, along Grand River Ave., it’s all about the street art and graffiti murals. Rebel Nell, Rusinow explains, employs disadvantaged women to repurpose these very graffiti paint chips into jewelry. “Adaptive reuse” is a term everyone uses here. The Globe Building, part of an 1860s-era riverfront complex that sat vacant for decades, is now the incredible Outdoor Adventure Center, created by the Michigan Department of Natural Resources. Inside the centre (the name is a tad misleading), kids experience the great outdoors indoors with hands-on activities, exhibits and simulators. They touch a “waterfall,” climb an “oak tree,” walk across a suspension bridge, “fish” from a boat and take a simulated trail ride on a real snowmobile. Speaking of transportation, this city is moving beyond cars.